Here are some snazzy birthday facts about 25th of July 1950 that no one tells you about. Don’t wait a minute longer and jump in using the content links below. Average read time of 10 minutes. Enjoy! What day was my birthday Jul 25, 1950? July 25, 1950 was a Tuesday and it was the 206th day of the year 1950. It was the 30th Tuesday of that year. The next time you can reuse your old 1950 calendar will be in 2023. Both calendars will be exactly the same! This is assuming you are not interested in the dates for Easter and other irregular holidays that are based on a lunisolar calendar. There are 98 days left before your next birthday. You will be 69 years old when that day comes. There have been 25,104 days from the day you were born up to today. If you’ve been sleeping 8 hours daily since birth, then you have slept a total of 8,368 days or 22.91 years. You spent 33% of your life sleeping. Since night and day always follow each other, there were precisely 850 full moons after you were born up to this day. How many of them did you see? The next full moon that you can see will be on April 19 at 11:14:00 GMT – Friday. Fun stat: Your first one billion seconds (1,000,000,000) happened sometime on April 2, 1982. 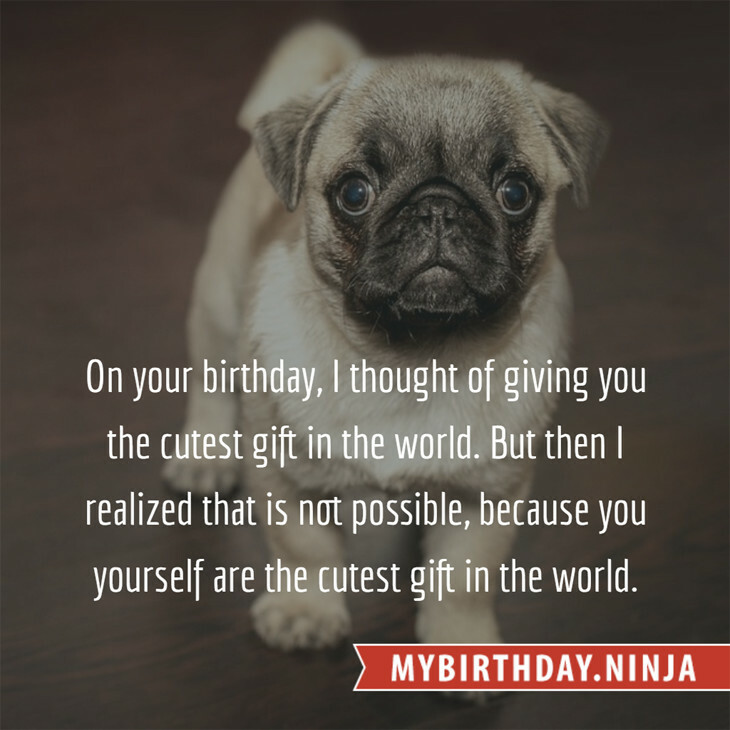 If a dog named Moppy - a Norwegian Elkhound breed, was born on the same date as you then it will be 326 dog years old today. A dog’s first human year is equal to 15 dog years. Dogs age differently depending on breed and size. When you reach the age of 6 Moppy will be 42 dog years old. From that point forward a medium-sized dog like Moppy will age 4.5 dog years for every human year. Battle of Ourique: The Almoravids, led by Ali ibn Yusuf, are defeated by Prince Afonso Henriques who is proclaimed King of Portugal. British governor Charles Lawrence and the Nova Scotia Council order the deportation of the Acadians. Thousands of Acadians are sent to the British Colonies in America, France and England. Some later move to Louisiana, while others resettle in New Brunswick. The first commercial use of an electrical telegraph is successfully demonstrated by William Cooke and Charles Wheatstone on July 25, 1837 between Euston and Camden Town in London. General Henri Guisan orders the Swiss Army to resist German invasion and makes surrender illegal. Norwegian Manifesto calls for nonviolent resistance to the Nazis. World War II: Operation Spring: One of the bloodiest days for the First Canadian Army during the war: One thousand five hundred casualties, including 500 killed. Viking program: Viking 1 takes the famous Face on Mars photo. Concorde Air France Flight 4590 crashes at Paris Charles de Gaulle airport, killing 113 passengers. Pratibha Patil is sworn in as India’s first female president. WikiLeaks publishes classified documents about the War in Afghanistan, one of the largest leaks in U.S. military history. What does my birthday July 25, 1950 mean? Your birthday numbers 7, 25, and 1950 reveal that your Life Path number is 2. It represents balance, harmony and partnership. You have the soul of an artist. You are a fine companion and possess a good sense of humor. Friends seek you out for your calming and peaceful company. The following celebrities also have the same life path number: Danny!, Francesca Capaldi, La Belle Otero, Rojda Demirer, Valeria Bruni Tedeschi, Andreas Kisser, Juri Miyazawa, Arsinée Khanjian, R. G. Armstrong, Kim Ok-bin. 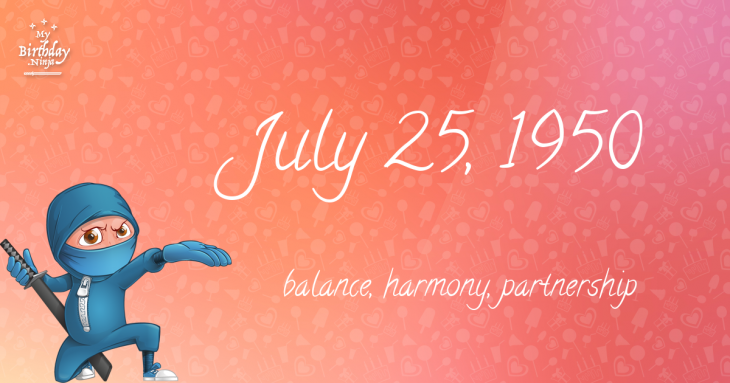 What is the birthday horoscope for Jul 25, 1950? The Western zodiac or sun sign of a person born on July 25 is Leo ♌ (The Lion) – a fixed sign with Fire as Western element. The ruling planet is Sun – the center of our universe. According to the ancient art of Chinese astrology (or Eastern zodiac), Tiger is the mythical animal and Metal is the Eastern element of a person born on July 25, 1950. Fun fact: The birth flower for 25th July 1950 is Larkspur for haughtiness. What is the Love Match for Jul 25, 1950? When it comes to love and relationship, you are most compatible with a person born on August 9, 1948. You have a Love Match compatibility score of +155. Imagine being in love with your soul mate. On the negative side, you are most incompatible with a person born on March 9, 1964. Your incompatibility score is -147. You’ll be like a cat and a dog on a love-hate relationship. Arf-arf, I want to bite you. Meow-meow, stay away from me! How many babies were born on July 25, 1950? Base on the data published by the United Nations Population Division, an estimated 97,399,411 babies were born throughout the world in the year 1950. The estimated number of babies born on 25th July 1950 is 266,848. That’s equivalent to 185 babies every minute. Try to imagine if all of them are crying at the same time. What is the popular baby name on 25 Jul 1950? Here’s a quick list of all the fun birthday facts about July 25, 1950. Celebrities, famous birthdays, historical events, and past life were excluded. Try another birth date of someone you know or try the birthday of these celebrities: December 7, 1961 – Dawn Sears, American singer-songwriter (d. 2014); April 18, 1946 – Hayley Mills, English actress and singer; June 3, 1942 – Anita Harris, English singer and actress.